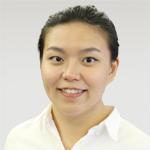 Bachelor of Physical Therapy and Assistive Technology, National Yang-Ming University, Taiwan Phoebe has worked in both Taiwan and Singapore in hospital and outpatient orthopedic settings prior joining Space. As a physiotherapist, she was a back pain patient caused from work. That’s when she started to approach Pilates and realize the importance of core, beauty of the movement control and the relationship between mental and physical balance. During working in Singapore, Phoebe has attended and finished the whole Rehab Module (1-6) course of Polestar Pilates and applied Pilates exercise to her clinical work. Starting with Maitland concept to assess client’s limited movement and body performance, Phoebe always listens to clients’ words and what their bodies want to tell carefully to find out the origin of the problem. Then she would apply the proper technique from Mulligan and PNF (Proprioceptive Neuromuscular Facilitation) concept to release the excessive tension of the soft tissue with breathing pattern adjustment and maybe some active movement from client to help the body and joint return to the best posture and position for moving. Phoebe believes it’s more effective for client’s body to be aware of the correct posture and movement from his active moving. Movement training in different gravity affected posture and weight giving helps client to find the correct movement pattern. And through the posture adjustment, client can be more confident of putting the center of gravity of his body at the right place and also realize how to control his core to prevent further injury in his daily life. Phoebe is specialized in neck, shoulder and spine issue. However, sometimes the discomfort doesn’t present at the origin. Hence every client requires a proper and detailed assessment from profession to find out the real cause and followed with tailored program to solve the problem. Phoebe believes that age and pain should not keep you away from what you really enjoy about life. Proper approach actually can make a difference. You will also enjoy the session with Phoebe because she always spends her quality time with her clients.